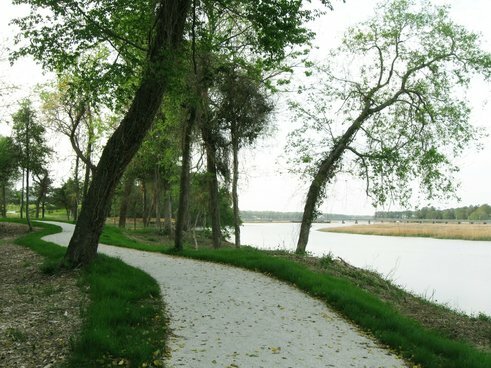 Over 3.8 miles of walking trails and bridges wind through pristine wooded areas, along beautifully landscaped open areas, and adjacent to picturesque creeks and marshes in the park. Five pedestrian bridges cross the creeks and marshes, and numerous overlooks are strategically located for resting and sightseeing. The trails were constructed to "Sustainable Trail Design" standards and are ADA compliant. Dogs (on leashes and accompanied by their handlers are allowed.